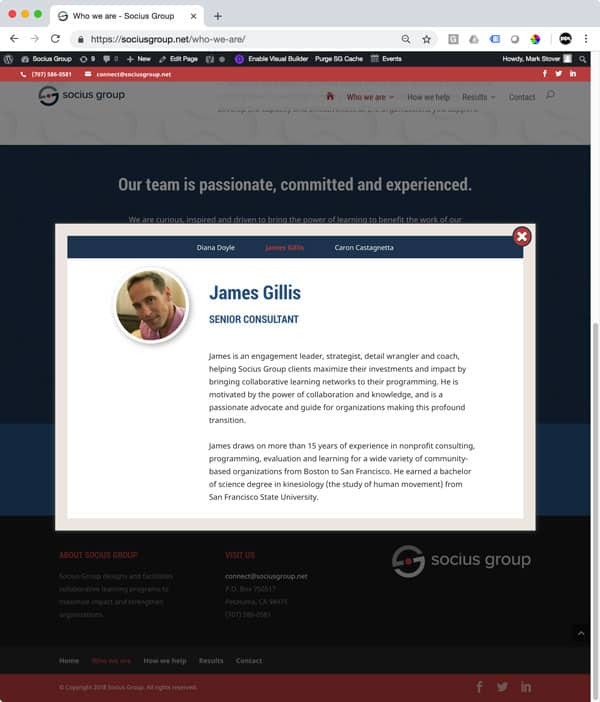 Stoverpix worked with the Socius Group team to update the entire brand to better represent the personal, bold, yet fun and friendly approach they take with clients and projects. One of the first orders of business was to develop a style guide with updated logo, color palette, font usage and icon style. We then used that to define the website. It was very important that the website be easily updated with very little technical expertise. 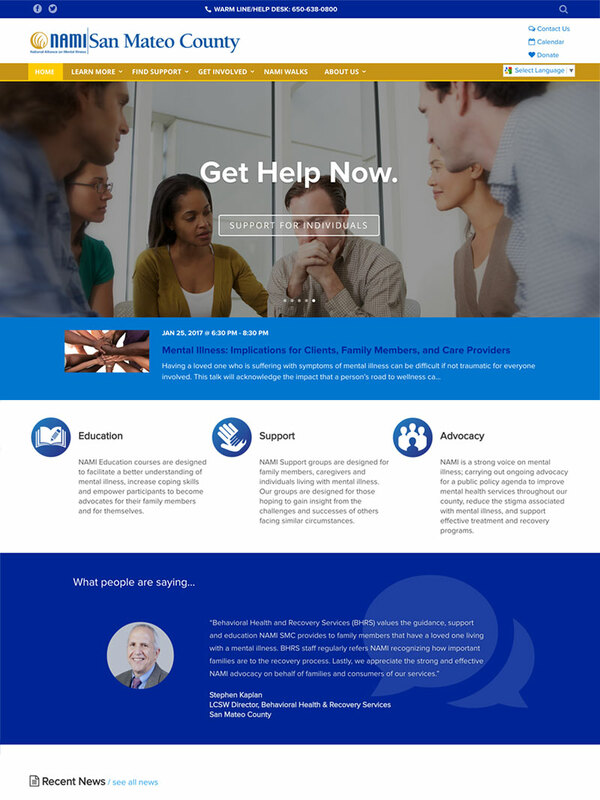 Stoverpix chose the WordPress DIVI theme to achieve that. Conceptually this logo is working well with the 2 mirrored shapes making an S but feels a bit too generic and corporate. By adding the red dot in the middle we tie the picture symbol in with the “i” in the text—and giving it a 15° tilt we add a bit of personality or attitude missing from the original. 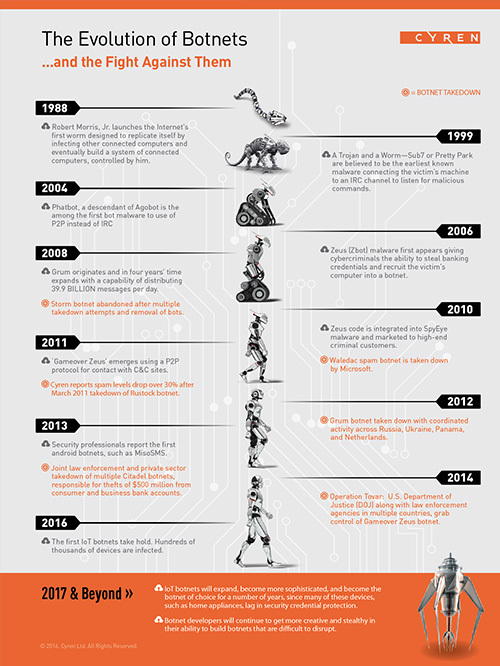 Cyren’s cloud-delivered security services protect over 600 million web and email users against Internet threats. 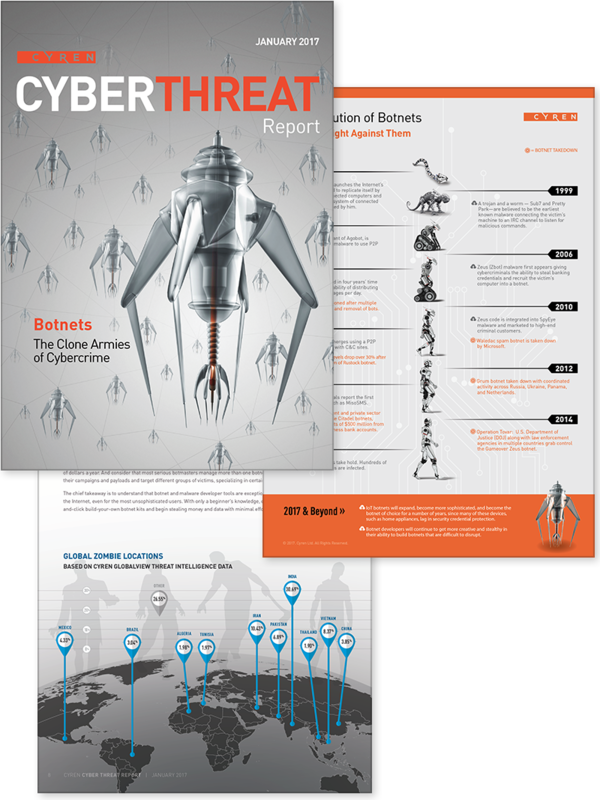 Cyren entrusted Stoverpix to design and produce their Phishing Cyber Threat Report for 2016. 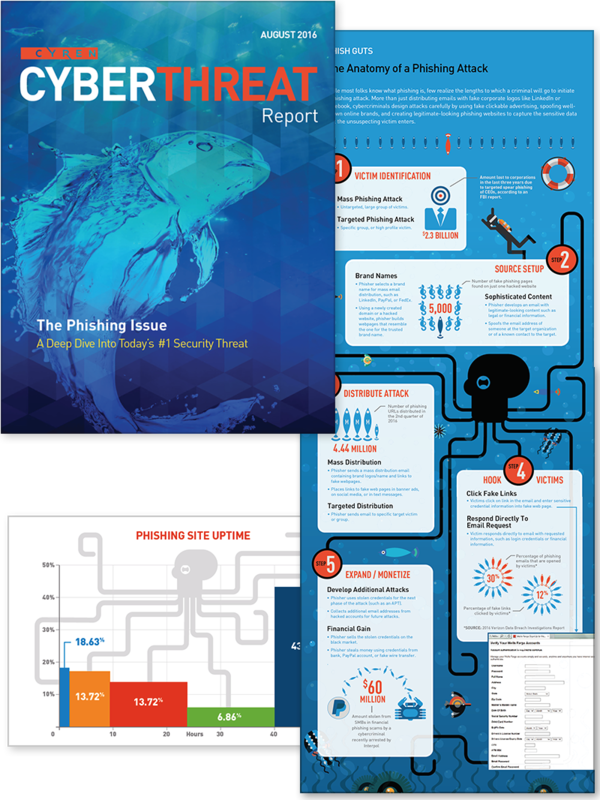 This is a 26 page report which is a deep-dive into the intricacies of the inner workings of phishing, the history of phishing, and and how Cyren can protect clients from being a target of the Phishing attacks. Stoverpix is responsible for all aspects of design, production, output, and overall visual conception of an infographic, many custom charts and everything creative. Reach for Home (formerly North Sonoma County Services) worked with Graybird Foundation to create a new brand to more accurately represents the services rendered to the surprisingly large number of homeless in this normally perceived affluent community—which according to the 2016 Sonoma County Homelessness Census and Survey, nearly 3,000 adults and children live without housing. Three times higher than the national rate of homelessness. 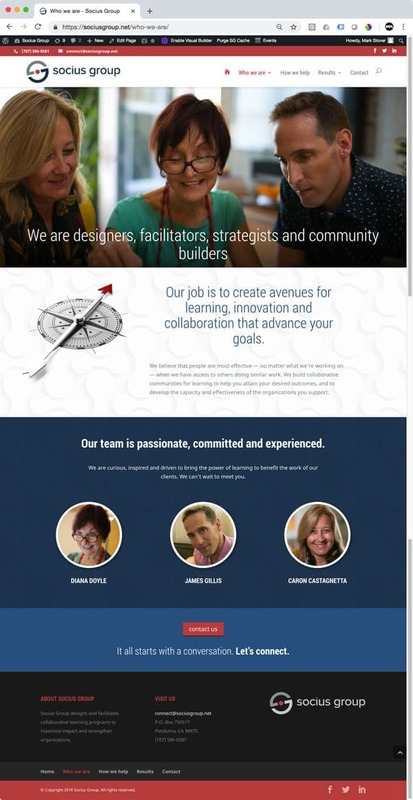 SquareSpace was chosen as the website framework to facilitate ease of management for a generally non-technical staff and take advantage of the tightly integrated donation and commerce tool offerings. However there are design challenges within the SquareSpace infrastructure in that none of the template offerings accommodated all the design requirements we envisioned. StoverPiX did an extensive evaluation of all SquareSpace templates and settled on the Adirondack theme for it’s strong commerce features and secondary navigation options. 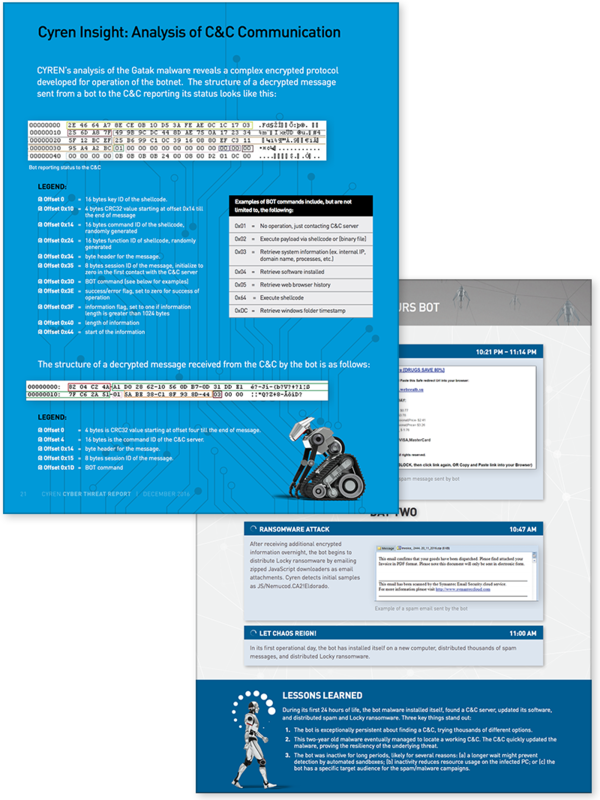 Custom code was written by StoverPiX to enhance the theme and achieve the design requirements the theme was not designed for. See the bottom of this page for specifics. The purpose of the Reach for Home programs is to provide opportunities and support for clients to work toward self-sufficiency, independence and permanent housing. Clients team with a case manager to help access resources and services that will help them make necessary changes in their lives. Furthermore, our program offers clients the opportunity to gain self-confidence and to become self-sufficient. SquareSpace can be a slightly frustrating environment if you are a designer intent on having your design be explicit to your vision. Luckily they do allow you to re-style the CSS to a surprisingly large degree, and if you really want to get geeky, you can enter developer mode and rework the entire template—or create your own custom template. Below are a few shared CSS code snippets you can copy/paste which may be helpful for those interested in adding similar features to SquareSpace. This is one of the most frustrating things about SquareSpace. How to make a colored row in a page. Sure you can do it with a Single-Page template, but not with a Multi-Page template like Adirondack. The forums have some fairly obtuse solutions, but I this solution is much simpler. Use the page CSS editor and not the site CSS editor. See the Advanced tab PAGE HEADER CODE INJECTION in the page panel. This eliminates having your row code effect other pages in the site and makes it much easier to target the row you want to color. You MUST separate your row from all other rows. This is achieved by adding a full-width divider. SquareSpace will see these as new rows and can be targeted as such. Note that it may require a little trial and error as SqSp code can vary depending on template and how you created the page. Inspect your code in chrome or similar and find the class for that row. This may be different than my example. Add your custom code like below. This is only a problem in Adirondack, as it by default adds your Page Title and Description below the banner area. I almost didn’t use the Adirondack template for this reason, but I did not want to give up the built-in secondary nav bar. Most templates are fine, but this may be a helpful example to you for controlling the banner text—and very useful for Adirondack. This again is an Adirondack problem. Many SqSp templates do have this option built in. This took some effort as other elements in the navigation are also affected. Custom FAQ accordion widget added. Sorry, no code included for these enhancements. Feel free to contact me for more info. Surviving Skokie is an award winning documentary by former Skokie resident Eli Adler about the provocative events of the 1970s, their aftermath, his family’s horrific experience of the Shoah, and a journey with his father to confront long-suppressed memories. 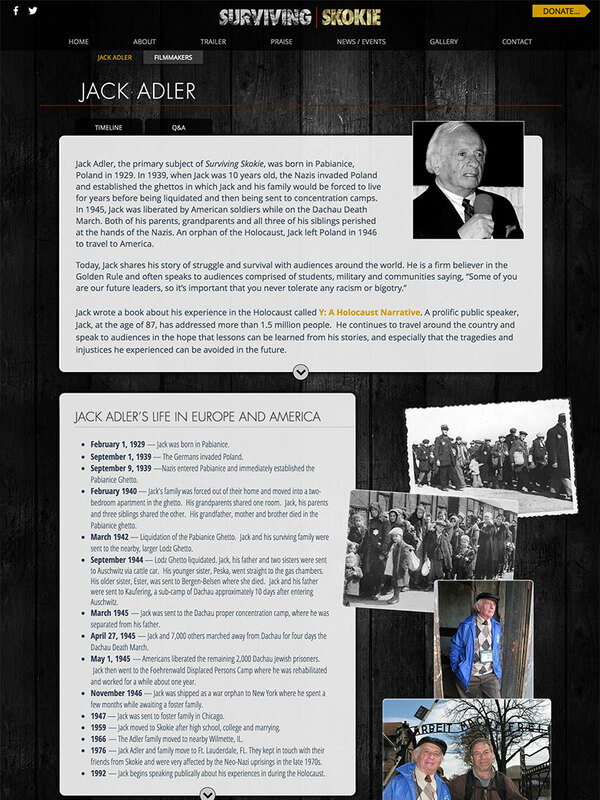 Eli Adler—a California-based professional cinematographer – started a quest to create his own movie and uncover details of his father, Jack Adler’s, painful past during the Holocaust. Inspired by a Chicago Tribune article and the 2009 opening of the Illinois Holocaust Museum & Education Center, the award-winning documentary is a ten-year labor of love. 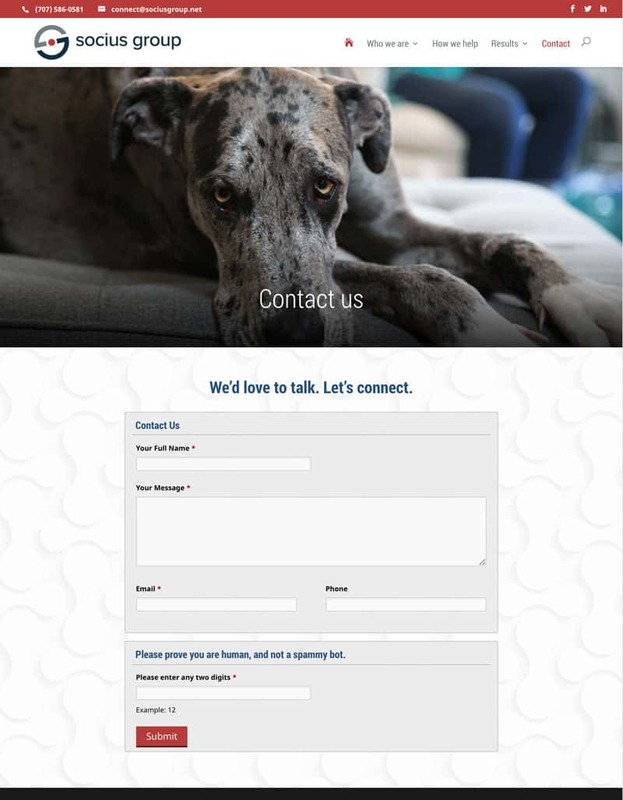 Stoverpix was charged with interpreting the marketing strategies of graybirdfoundation.org into page designs which would facilitate the existing NAMI SMC content. 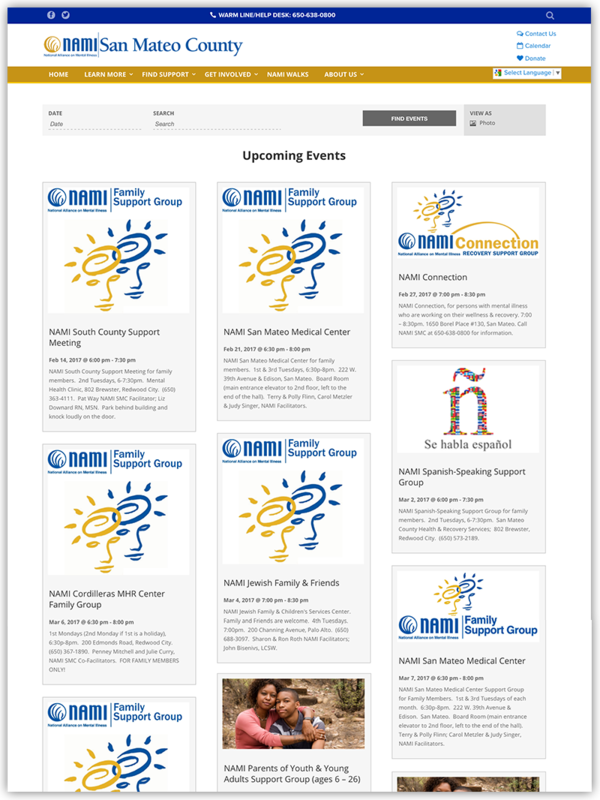 The site was built in WordPress and all content was ported into the new site, reorganized per GBF specs so the content was simpler to browse, and made easier to update for the NAMI staff. 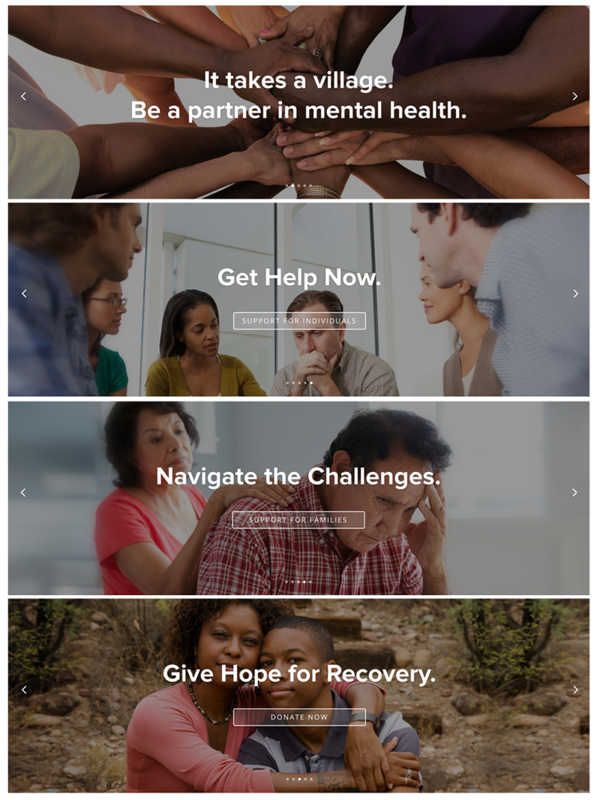 National Alliance on Mental Illness (NAMI) San Mateo County (SMC), was founded in 1974 as the Parents of Adult Schizophrenics. The organization was subsequently renamed the Alliance for the Mentally Ill of San Mateo County, until its reformation in 1979 as the National Alliance on Mental Illness. 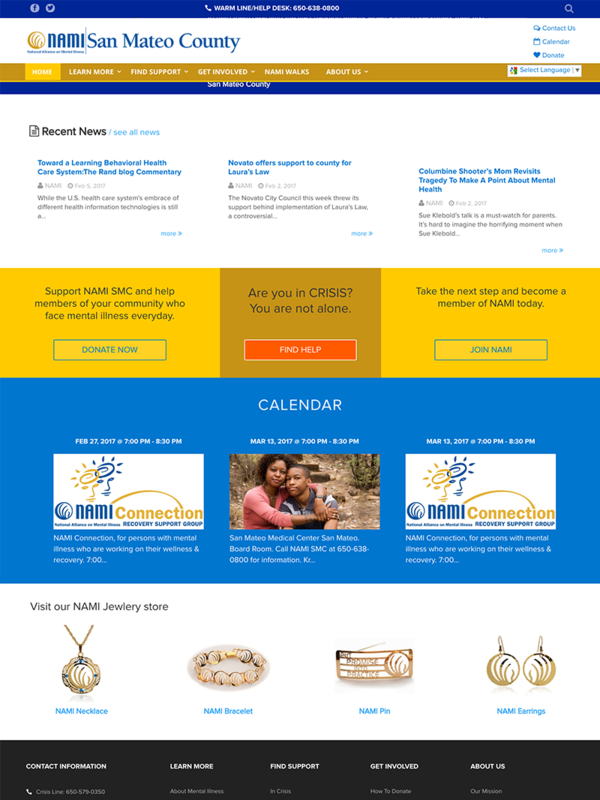 NAMI SMC is a non-profit 501(c)(3) exempt organization governed by a dedicated volunteer Board of Directors. The Board is comprised of family members who have a loved one with a mental illness and other interested parties involved in the local mental health community. 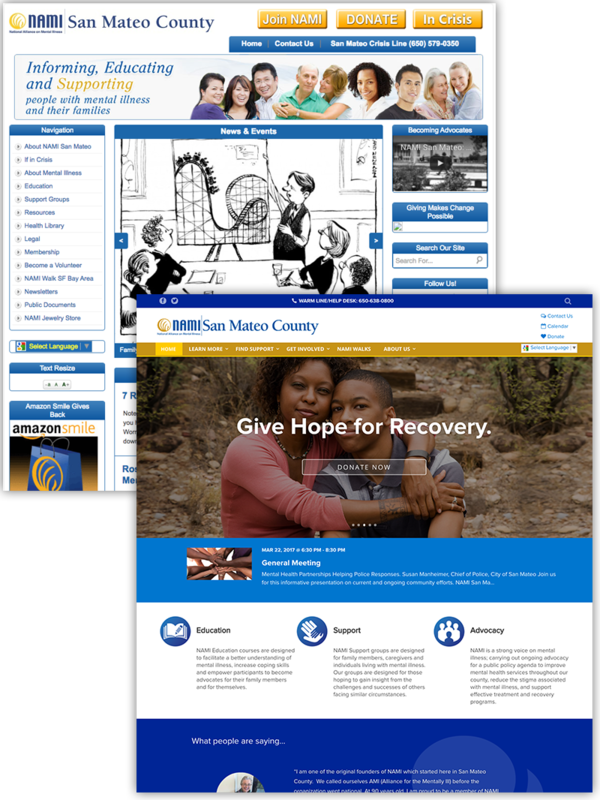 As an independently operating nonprofit, NAMI San Mateo County receives no funding from NAMI National nor NAMI California. 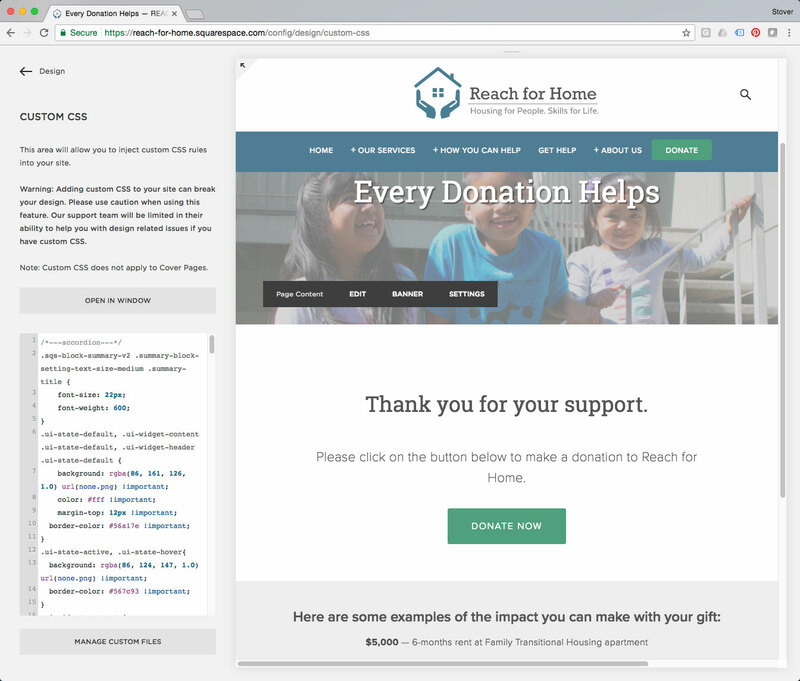 Graybird Foundation called on Stoverpix to build a website for the nonprofit LifeMoves (previously InnVision Shelter Network) after another vendor pulled out at the last hour. The project was delivered on-time, in-spite of the many custom requirements and fluid content changes along the way. From that, a partnership was born. 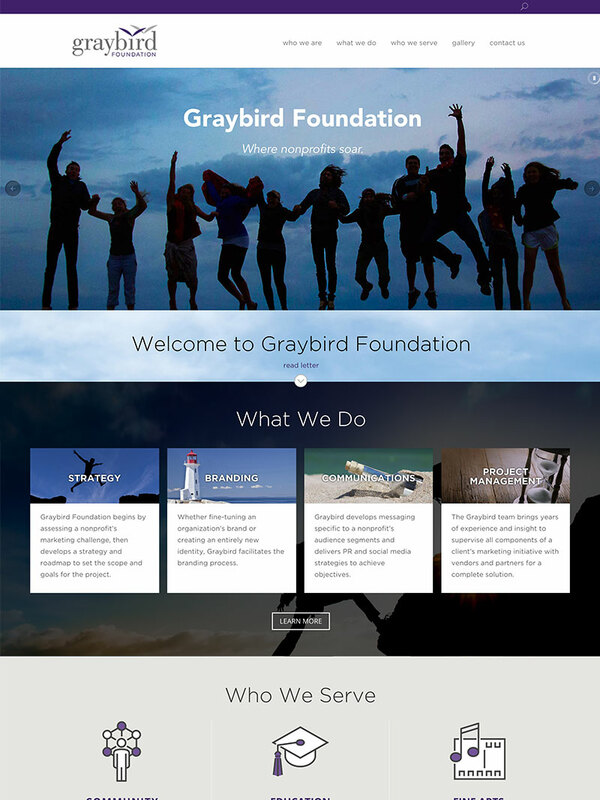 After partnering on several other projects, it was time to design and build a nonprofit website for Graybird Foundation. The idea was to keep it simple, modern, clean and easy to update. 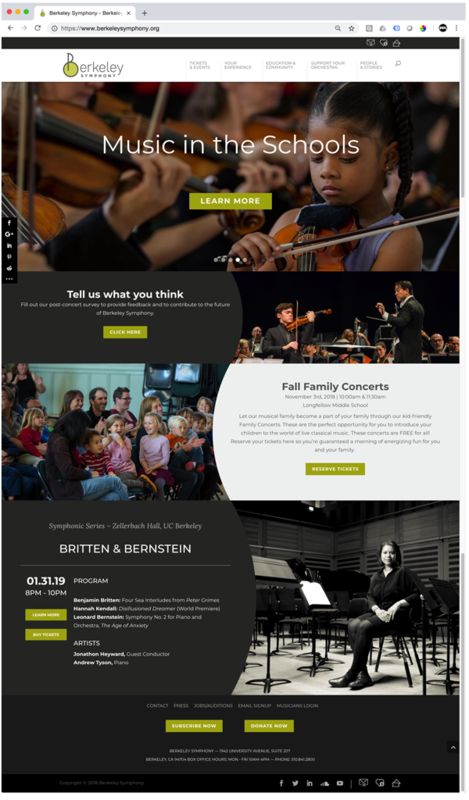 Graybird Foundation donates marketing expertise and services to community, education and fine arts nonprofits in the San Francisco Bay Area. GBF teams with their valued clients to identify, scope and deliver a bold marketing move. 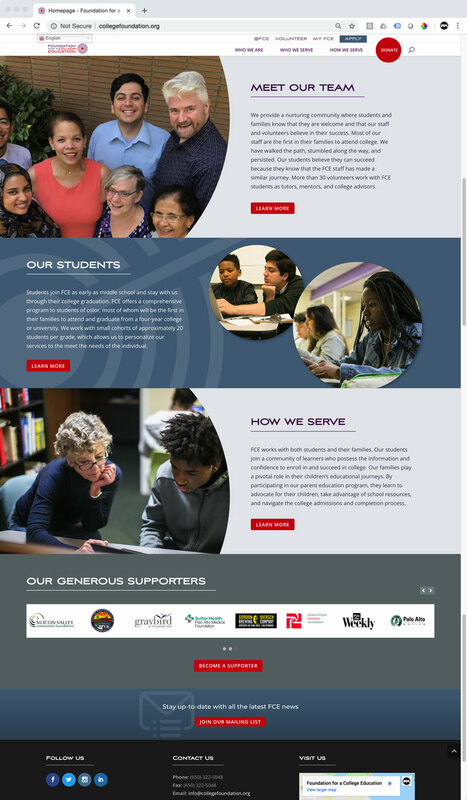 Stoverpix has partnered with Graybird Foundation to realize that mission by designing client nonprofit websites, developing creative and producing the web experience and all graphic assets.